A measure of central tendency is a value that attempts to describe a set of data by identifying the central position of the set. The most commonly used measures of central tendency are the mean, median and mode. the mode is used to find the most "popular" value in the data set. • is the number found by adding all of the values in the data set and dividing by the total number of values in that set (finding the average of the data set). The mean is often thought of as the balance point of the data set. Note: Do not round unless told to do so. Give full calculator result. • is the middle number in an ordered data set. The number of values that precede the median will be the same as the number of values that follow the median. The median is a midpoint of the distribution. 1. Arrange the data into ascending (increasing) or descending (decreasing) order. 2. If n is an odd number, the median is the middle value. • If n is an even number, the median is the average of the two middle values. Note: Think of the "median on the highway", which is in the middle. • is the value in the data set that occurs most often. When data is presented in a frequency table form, the mode is the value with the highest frequency.In a histogram, the highest bar is the mode. It is possible to have more than one mode. If there is no repeated value in the set, there is no mode. Note: If there is no mode, be sure to write "no mode" and do not write zero (0). * is most typically used with categorical data. Which Measure of Central Tendency is the Best Choice? Each of the measures of central tendency has "Pros" and "Cons". Use the mean to describe the most "typical" value of a set that does not have an outlier. (An outlier is an extreme value that differs greatly from the other values in the set.). • yields one distinct answer. • useful for comparing sets of data. • yields inflated or deflated result when extreme values (outliers) or skewed data are present. The mean has a tendency to be pulled toward extreme values. 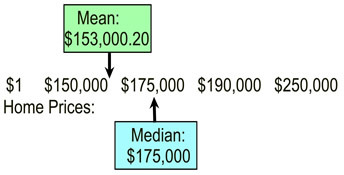 Use the median to describe the most "typical" value of a set that does have an outlier. do not affect the median as strongly as they affect the mean. • not as popular (or used as often) as the mean. Use the mode to describe the most "popular" value of a set. • works with numeric and non-numeric data. Most used with non-numeric data. • outliers (extreme values) do not affect the mode. • may not be one distict answer - there may be more than one mode in a set (or no mode in a set). • since there is the possibility of more than one answer, how do you decide which one best describes the central tendency? • if no values in the set repeat, the mode is useless (as there is "no" mode). • misleading as a central tendency if found far away from the rest of the data. • not as popular as the mean or median. This graphic shows a listing of home prices arranged in ascending order. The mean and median are shown. This graphic is the same as the one on the left, except the lowest price has been replaced with an outlier. The $100,000 home has been "gifted" to a relative for $1. With the outlier, the mean changed. With the outlier the median did not change. Added: When the same value (5) was added to each value, the same amount (5) was added to the mean, median and mode. Since all values shifted by the same amount, the central tendencies shifted by that same amount. Multiplied: When the same value (3) was multiplied times each value, the same amount (3) was multiplied times the central tendencies. With the data in ascending order, you can easily find the median. • Mode: Each number is listed only once, so there is no mode. Read more at Measures of Center.